It’s hard to believe computers used to take up entire rooms or that your cell phone has more computing power than was necessary to put men on the Moon, but it’s all true. We’ve come a long way since the 1960’s and 70’s, but surprisingly we’re still using solar technology that has only moderately improved over the decades. Sure, there are new materials and new applications for solar power—the solar-powered boat comes to mind—but efficiencies as a whole have not drastically increased. Take a look at the following graph from the National Renewable Energy Laboratory (NREL). 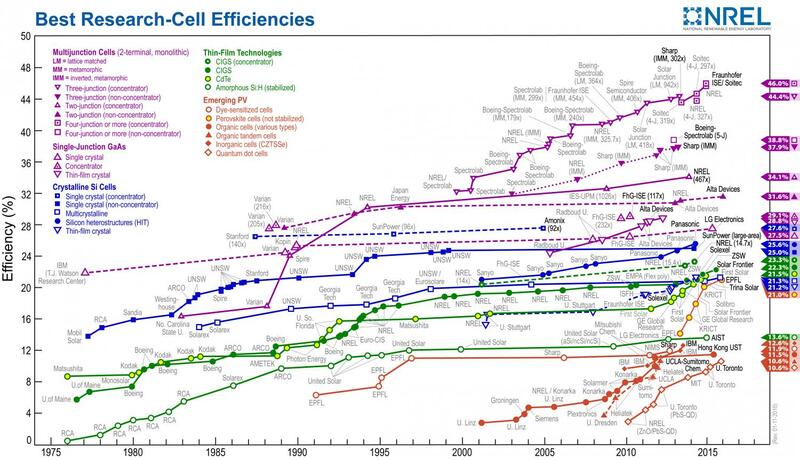 It’s an overly busy graphic, for sure, but just focus on the blue lines—the crystalline silicon solar modules. This is the most common form of solar you’ll see, but as a whole, the panel efficiencies only make it to the mid-to-high twenties range. Even then, these efficiency ‘records’ tend to exist only in the laboratory under non-standard atmospheric and lighting conditions. In the real world, most solar panels tend to have efficiencies in the 16-19% range though some manufacturers like MIssion and Sunpower have higher-end panels that have efficiencies exceeding 20%. But, for the most part, it doesn’t really matter if you use the most efficient panels for residential applications unless you have a limited roof space. Having a more efficient solar panel does not necessarily mean it’s better, it just means it can generate more energy in a smaller area. If you have abundant roof space, for example, it might be more advantageous to install a greater number of cheaper panels rather than pay a premium for more efficient panels. But the panel’s abilities by itself are only a part of the story. There are several other factors that affect solar panel efficiency and the ability to convert sunlight into energy for use in our homes and businesses. Believe it or not, warmer temperatures actually have an adverse effect on the production of solar panels. Sounds crazy, right? You’d think warmer temperatures would be better because there’s generally more sunlight when it’s warmer, but prolonged heat exposure can prematurely degrade solar cells. For daily production, high temperatures cause a drop in voltage and, in turn, a drop in power. Power is the product of voltage and current (P = V x I), so although current increases slightly with temperature, the overall power is reduced by a significant drop in the potential difference between the electrons (voltage). You see, sunlight is made up of charged particles called photons that originate from the collision of hydrogen atoms in the Sun’s core. As these photons impact the semiconductive service of the panels (the solar cells), they impart their energies into the electrons in the cell. Once these electrons are excited to a higher energy state, they move around and are ultimately collected and channeled into a stream of electrons (AKA electricity). If you raise the temperature, the electron’s “rest temperature” is effectively increased. Since it takes less energy to excite the electron, less energy is initially transferred from the photon. As a result, your system produces less electricity. Now before you start fanning your solar panels with palm fronds, you should know that only extremely high temperatures will have a significant impact on solar panel efficiency. So if the panels are in the middle of a desert, for instance, they’ll likely see a decrease in performance (not to mention a fair amount of dust). If, however, you’re in the city, this will only be a problem on the hottest days, in the hottest months. To mitigate this issue, you will generally see residential solar panels elevated slightly on roofs so as to improve air circulation and effectively cool the panels. This is also why floating solar arrays are gaining popularity as water helps to cool the system and slightly improve panel efficiency. As logic would dictate, you’re likely to find wind turbines in areas with a steady supply of wind, hydro plants next to water, and solar power systems, well, where there’s lots of sunlight! Every renewable technology needs an energy source, and solar’s fuel pump is sitting roughly 93 million miles away at the center of our solar system. That being said, not all places on Earth receive the same abundance of annual sunshine. Knowing your home’s relative insolation—the amount of solar radiation received in a given area—is crucial in designing a cost-effective solar array for your home. Insolation is determined by factors such local weather, the time of year, and most importantly the latitude of your home or business. Have you ever wondered why we have seasons? Well, in a nutshell, it’s because the Earth is tilted by 23.5 degrees and parts of the planet will be closer to the sun at different times of year (closer is summer, further is winter). Without getting too deep in orbital mechanics, this translates to the Sun being at different altitudes in the sky depending on the season. The Sun will be highest in the sky in the summer and lowest in the winter, so your solar panel’s production numbers will vary according to the season. Remember—it’s all about annual production. Your system will undoubtedly produce more electricity in the summertime, but you’re also probably using more electricity too—especially if you live in the South where you can’t live without A/C. Your Roof Plays a Part in Efficiency Too! Just like having to face a dartboard to hit the bullseye, your panels need to be pointed at the Sun in order to maximize production. System designers accomplish this by orienting the panels such that their pitch and azimuth allow for the most annual exposure. So this is where your home’s geometry becomes critical. ‘Roof pitch,’ for example, is the slope or relative steepness of your roof. Since the Sun varies in its altitude angle throughout the year, the panels need to be tilted so that—on average—they receive the most sunlight. This angle is typically the same as your local latitude. So if you’re living in Chico, California, for instance, your panels would be angled at about 40 degrees, mirroring your local latitude. Keep in mind that this angle is relative to the ground, not the surface of your roof. The angle between the panels and your roof would be your latitude minus the roof pitch (the tilt angle). The other angle you have to take into consideration is the azimuth angle, which is typically measured from a cardinal direction like north or south. In the United States, pointing your panels perfectly south is ideal ( the same direction as you satellite dish ) because they will see maximum sunlight exposure. It’s not the end of the world if you have an east/west facing roof, though. Systems are frequently seen nowadays on roofs with east/west orientations. The only direction you wouldn’t orient your panels is north (unless you’re living in the southern hemisphere. To clarify—this is because the Earth is more or less a sphere. For folks living in the northern hemisphere, the sun will appear to be in the southern part of the sky. This is opposite for residents of the southern hemisphere. There’s a common misconception that cloudy days prevent electricity generation. While the solar panels for your home will definitely see a drop in production, they’re still receiving light and still converting that light into electricity. The mere fact that you can see the panels on your roof means there’s light getting through the opaque cloud cover. What matters is the annual abundance of sunshine—not a single cloudy day where the panels might only produce about 20% of their rated capacity. I just returned from Portland, Oregon where there was a lot of talk about solar for homes, it turns out that Portland gets the average amount of sunshine for U.S. cities. Despite the city being particularly dreary at times, the fact that it’s cooler in temperature means solar panels will have improved efficiencies compared with a warmer city that might get the same level of sunshine. Heck—look at Germany. The Germans—until recently—led the world in solar energy production, and their country isn’t touted as a tropical paradise awash in a sea of sunshine. Despite their more northern, temperate climate, they comprise about a fifth of the world’s solar, roughly 40 gigawatts worth of installed capacity. This one is fairly self-explanatory, but I can’t stress the effect of shade as it’s particularly detrimental to your residential or commercial solar power system. The good news is that it’s also one of the easiest to control as it isn’t an environmental factor (unless you count trees). Shade is the enemy of solar because—much like clouds—it is blocking the sunlight required to produce electricity. So, for instance, if you have lots of surrounding trees, you will likely need to trim or remove them in order to go solar. Roof obstructions like vents or chimneys can also be a problem though they are much less easy to work around. The reason shade poses such a major problem has to do with how solar panels are wired internally and to one another. In a panel, individual cells are wired in series so as to increase the module’s voltage, but they’re only as efficient as their weakest link. So even if a tiny portion of a module is shaded, the entire array will see a drop in power. This is true for the system as a whole as the panels themselves are connected in series (generally). But there’s a grand solution to this problem—using Power Optimizers like the ones 1876 Energy uses from Solar Edge. Essentially a Power Optimizer isolates an individual module such that its performance does not affect the other modules in an array. Think of microinverters like modern Christmas lights. Older strings of lights suffered the problem of “when one light stops working, they all stop working.” With a microinverter, the production of the shaded panel(s) will suffer, but the rest of the system will be fine. Even the best solar panels can have their efficiencies significantly impeded by environmental factors though with proper design, most—if not all—of these factors can be mitigated. The primary goal for most homeowners who go solar is to save money on their utility bills. If this can’t be accomplished to your satisfaction, or if it’s just not going to make financial sense to go solar, we’ll tell you right from the get go. 1876 Energy specializes in residential and commercial solar installations, and we pride ourselves on putting great care into delivering quality systems and solar education to all of our customers. Additionally, we’re able to mitigate some of these limiting efficiency factors by using the some of the highest quality components such as the time-tested solar modules from Mission Solar and the innovative inverter system from SolarEdge technologies. amazing blog. this is so informative. these affect of solar panel can be efficient for saving energy.